Roasted red potatoes offer a tasty alternative to standard potato dishes. 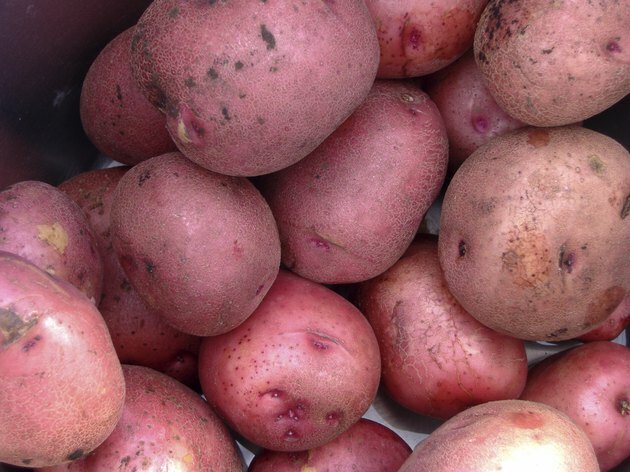 These small, round, red-skinned potatoes are a relatively low-fat source of dietary fiber. They are also excellent sources of potassium. Because of their smaller size, they can often be cooked more quickly than traditional potatoes; they are also very tender when fully cooked. Quick cooking techniques for red potatoes include boiling and microwaving, but for a flavorful, tender potato side dish, roast them in the oven with your choice of seasonings. Wash the potatoes under cool running water. Pat dry with paper towels. Remove a strip of the red skin from around the center of each potato, using a vegetable peeler or a paring knife. Leave the skin on the rest of the potato. Spray a baking dish lightly with cooking spray. Place the potatoes in a single layer in the baking dish. Mix olive oil, garlic salt and rosemary in a small bowl. Drizzle this mixture evenly over the potatoes in the baking dish. Sprinkle dried dill over the seasoned potatoes. Place the potatoes in a preheated oven. Roast for 35 to 40 minutes until golden brown and tender when tested with a fork. For a tangier version, sprinkle shredded sharp cheddar cheese, crumbled feta cheese or crumbled blue cheese on the potatoes for the last three to four minutes of cooking time.